You can be adventurous with your choice of bathroom curtains and still let them serve their practical purpose if need be. We've chosen a small bathroom to illustrate the difference that unusual bathroom window curtains can make. Note how the curve of the drape bisects and breaks the top edge of the window. By choosing a shimmering, fanciful fabric (as opposed to a heavy brocade), the curtain does not overpower the proportions of the room. On the contrary, it adds to the illusion of height by drawing the eye upwards. The gentle curve of the drape softens the lines of this rectangular bathroom and echoes the shapes of the basins. It does not restrict the natural light, seeing that the room has a relatively small window. The frosted glass ensures privacy for this particular bathroom, so there's no need to cover the window with traditional curtains or blinds. If you are not comfortable having only frosted glass, you can have a very simple roman blind to cover the window and use the softening drape. Think bigger than the small bathroom window - especially in small bathrooms. 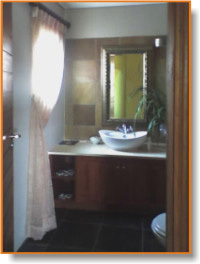 Is the window positioned such that it can become the focal point of the bathroom? Is it time to add a vibrant color, rich texture or unusual shape? 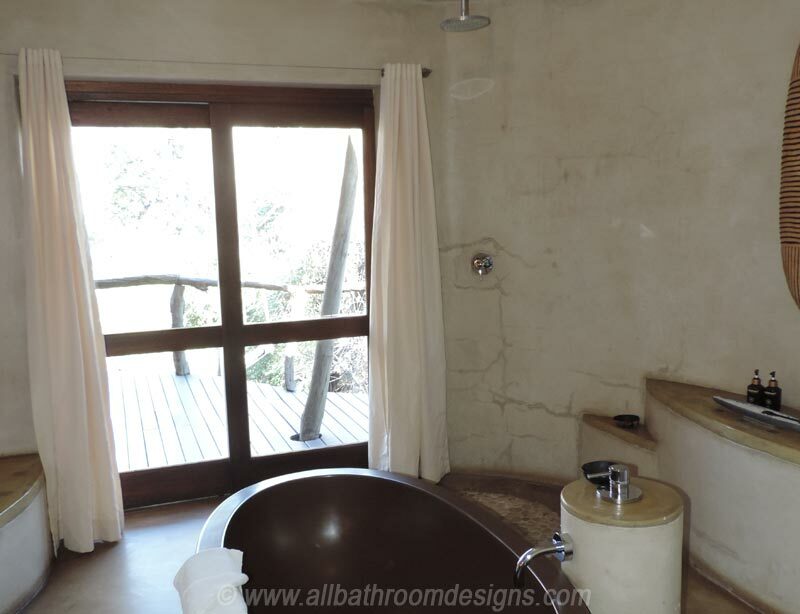 Imaginative bathroom window treatments like this become the focal point of a relatively small bathroom. It also adds a sense of the exotic when taking a long hot soak in that bath. Do take note of the generous lengths of fabric hanging down - this is not the time to skimp on a few feet of fabric. You could also tie a knot in the vertical lengths or puff them up around a beautiful cord. Installing the curtain rods is very simple or you can copy the look with wide towel rails. Taking the drape down for cleaning will only take a minute - so will putting it back. The real advantage though, is that you can change the fabric very easily and cost effectively, whenever the mood takes you. Talking about different moods: You can easily change the look or introduce a different texture with the use of an exquisite length of fabric from the East, hemp fiber gauze, sheer voile or delicate lace - the choice is endless. Having modern fixtures with simple clean lines does not mean you have to follow the same design principle in your bathroom curtains. A luxurious floor-length velvet curtain is used to great effect in this powder room. Note how the choice of color was influenced by the mosaic tile border. And of course, a curtain like this deserves the full treatment: a beautiful cord and tassel trim. Rich fabric such as this can make the whole room more inviting - and make a statement! You can use sheer fabric for a lighter touch. Just because a window has certain dimensions, it does not mean that you are restricted in the proportions of your bathroom window curtains. If the surrounding space is restrictive, a solution is to use an asymmetrical curtain as in these two bathroom photographs. 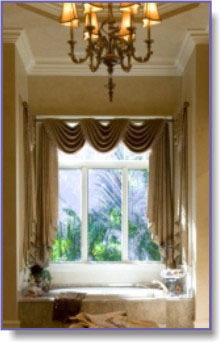 Using valances, drapes or brocades need not be restricted to the entertainment areas of the house. Styling a bathroom with a chandelier, marble and luxury finishes calls for an equally dramatic window treatment. Choosing a color that blends in, rather than a contrasting color is perfect for this master bathroom. 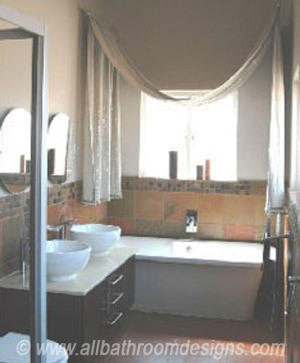 You do not need to spend a lot of money on the fabric for your bathroom window curtains. An inexpensive cotton fabric can be used very effectively. 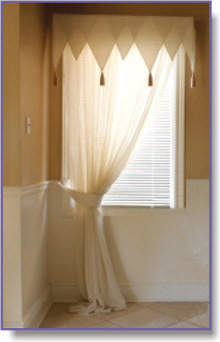 Add extra length to drape on the floor and give it the designer look with the curtain heading. Choose a beautiful set of finials or tie-backs to complement the hardware in your bathroom. Be sure to confirm with the fabric store whether you should pre-shrink your fabric before manufacturing your bathroom curtains. 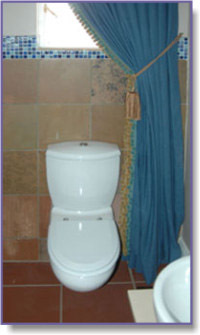 Looking back at the bathroom curtains - imagine removing the drapes and replacing them with fitted blinds. Which of the bathroom window treatments would you prefer?